One of the wedding project that we accomplished with limited period of time. 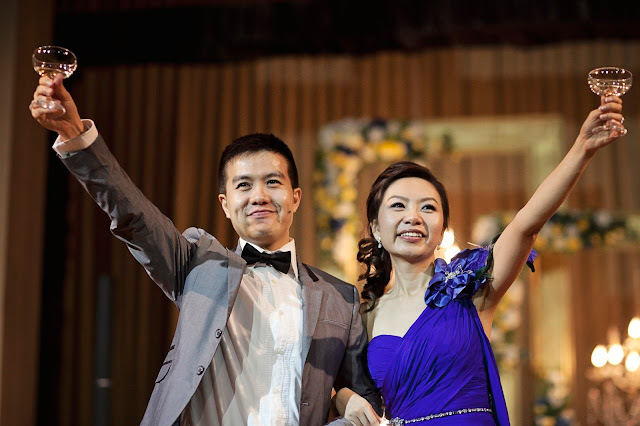 "We engaged Denise Tan and her team just 2 months before our wedding. Prior, we were experiencing huge stress in juggling both the wedding and all our other commitments. We chose Denise and her team after much deliberation as she came across to us as someone with a sincere and earnest personality. More importantly, she was able to have a quick and good grasp of what we had desired as our “unique and grand” wedding. She was idealistic and yet pragmatic person at the same time. Over the next 2 months, Denise proved to be of immense help to our wedding. She has the unique ability of visualizing the big picture as well as being very meticulous in all the finer and yet equally important details. Denise was also excellent in managing all our service providers in always ensuring that we get the best value out of them. She also constantly advise us on areas where we could achieve the same desired effects at a much lower cost. Her pragmatic approach allowed us to do much more with the same budget that we had. Denise is a very diligent and forward looking planner. She is excellent in anticipating possible challenges and will inform us prior so that we can make the most informed and appropriate decisions. She also posses great communications skill as displayed by her close rapport with both our families, groomsmen and bridesmaids throughout her entire stint. On our actual wedding day, Denise’s outstanding qualities shone through. She was hugely impressive in her multi tasking role as a wedding planner. She was so good that we could dedicate 100% of our energy to enjoying our “BIG DAY”. She was very thoughtful and personalized throughout the day always asking on our well being and if we may any other special needs. Nothing was considered impossible or too difficult for Denise. For example, we wanted to have 20 of our favourite Pre-Wedding Photos on display like an Art Gallery during our cocktail reception. It was highly expensive to engage professional service to put the pictures into the golden frames. Denise and her team went about quietly to nail every single picture into their respective frames without even informing us. It took her much time and great effort in putting this physically demanding task together. In nutshell, I would highly recommend or refer her great services to anyone else. Her professionalism, extremely high level of multi tasking competency and effective communication skills is second to none in this very competitive and highly skilled wedding planner industry. The level of service rendered by Denise far exceeds her charges. Denise and her team were instrumental in making our wedding more perfect that we had imagined it to be. " This is one of our favourite photo from their wedding. They look so satisfied and happy with their day. James and Jennifer, thank you again for trusting us to be part of your life journey.